Nothing says I hate my life like shopping for holiday gifts at the last minute, with a child in tow. I know, I've done it. Twice. 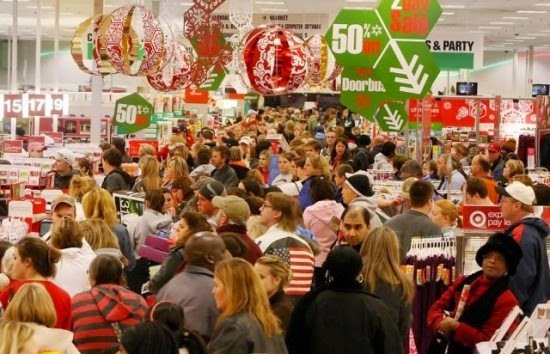 Last year I vowed to NEVER find myself in a line that snakes all the way to the back of the store, to buy over priced crap because I'm in a last-minute-pinch. So I made a plan. A really good plan to not only save time, but money too! Here are my best 10 Tips To Save BIG On Holiday Shopping... and not find yourself crying in a mile long line holding overpriced junk. 1. Plan ahead. Everyone's been naughty, just make the damn list already! Probably the biggest mistake I make is heading to the stores with a loose list of people to shop for, and a vague idea of what I want to get them. Nothing says FAIL faster! Make a list of anyone and everyone you may want/need to buy gifts for, then add your vague gift ideas... maybe even go so far as to just come out and ask them what they want. Then use this as your master list. Stick to it, and when that person has been taken care of, write down what you got them, and cross them off the list. 8. Shop Secondhand. What does every parent have in common at 2am on Christmas Eve/Hanukkah? They're putting together toys. So, if you are going to give your child a fully assembled toy anyway, why not just buy it secondhand, shine it up and slap a bow on it? Secondhand children's stores and higher end consignment shops have incredible deals on gently used items... so worth checking out!